So it’s Spring (okay, nearly Summer) and that means florals. Florals are freakin’ EVERYWHERE at the minute and it’s just something that’s natural at this time of year. Flowers blooming outside means flower patterns inside. There’s not been a year since I started blogging (2010 peeps) that it hasn’t been proclaimed that florals in some form or another are trending. Well, of course, they are. Florals in interiors go back centuries, they aren’t necessarily ever ‘out’. However, there might be certain types of patterns or colours that can quickly date a room so a balance is always key. I wanted to share some floral patterns that I really like and really work well in the rooms they are placed. They are all different but each of them provides an updated look and yes, I’m actually looking at including one of these in a future room in my home – no telling yet, though, that would be spoiling the surprise! Can you go ‘granny floral’ and also do chic and cool? Yep. 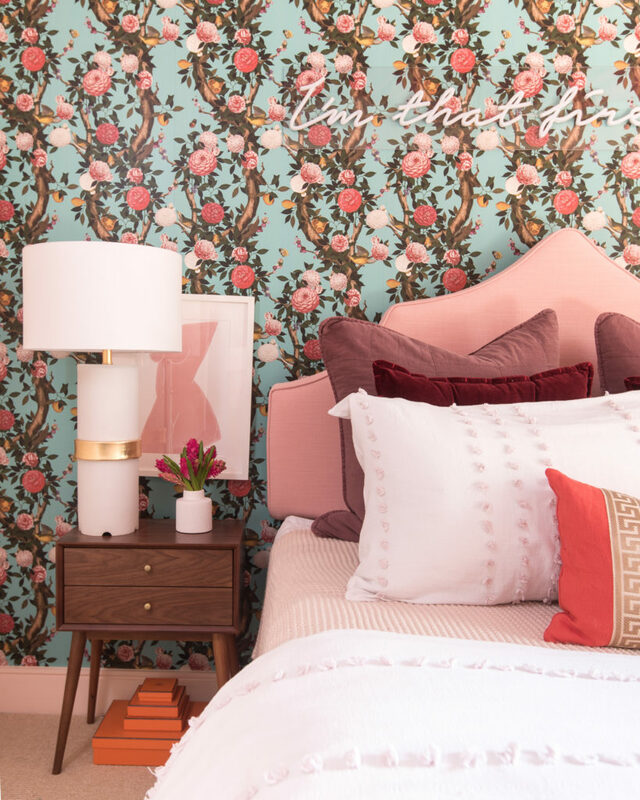 And this is illustrated perfectly above with Shannon Claire’s gorgeous bedroom makeover that she did for the latest iteration of the One Room Challenge. So if you are digging those vintage styles, have a look at why this works so so well in this space. You can see there are echoes of vintage style in the mid-century style of the bedside table. The bed, too, is a subtle nod to a French-style headboard but upholstered in simple blush pink velvet, it becomes a more contemporary interpretation. The oversized lamp and artwork are much more contemporary too. And of course, the neon sign is very on trend at the moment. 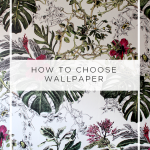 So balancing out that ‘granny’ design in the Garden Bloom wallpaper (in a very contemporary colourway – let’s be honest, it would not have worked as well had that been butter yellow and seafoam green in the design) with more contemporary elements creates the perfect mix and balance. Ahh the Victorians loved their floral patterns, didn’t they? 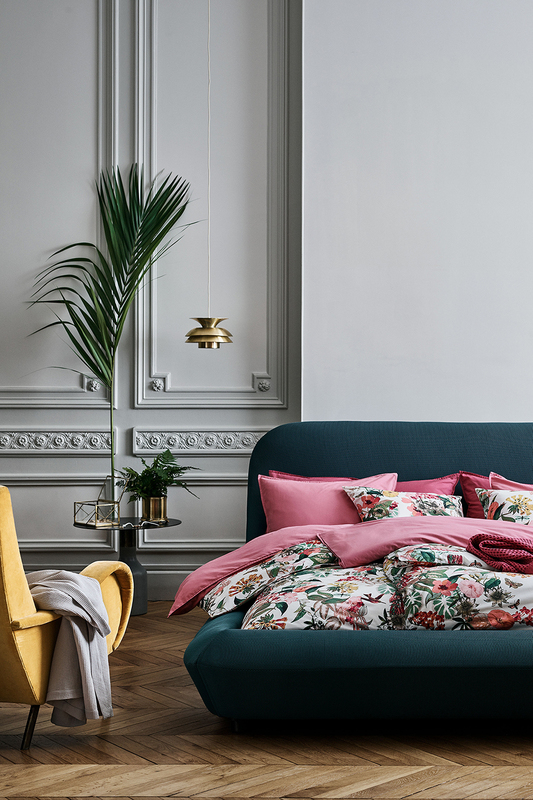 They would take a room and use the same pattern on every single wall, lamp, curtain, cushion for a vibrant layered effect that today, might leave your head spinning. But if you want to give that Victorian look a bit of an update, then consider taking a smaller floral pattern, as Emily Henderson did in the design above, to all four walls for the biggest impact. While this is not a look for everyone, using that wallpaper on just one wall wouldn’t have nearly the same effect. 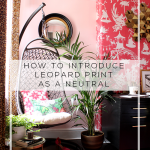 I talked more about good feature walls in this post but because the pattern is fairly small, using it everywhere creates so much more movement and gives the room the real wow-factor. The pattern here isn’t layered, however. The soft pink, greens and blues are repeated in the room with plain but luxurious fabrics – velvet cushions, a sumptuous buttoned throw, the leather headboard. This gives the eye somewhere to rest but still gives it a nod to that classic Victorian style. We can’t talk floral trends without talking about dark florals, right? 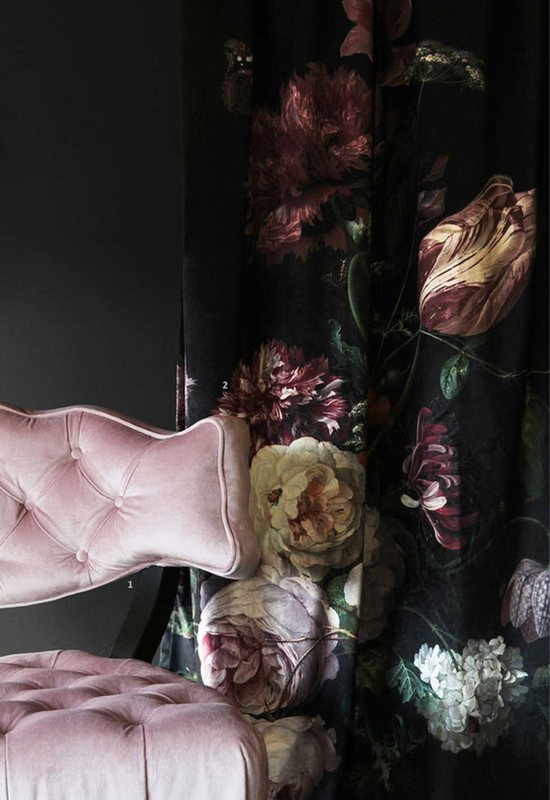 Oversized blooms that look like an oil painting are popular but they take on a kind of gothic luxe look when combined with a darker background. I adore these curtains from Rockett St George in velvet. You’d certainly not be limited to using these in a darkly-painted room either. I think even in a room that’s painted in a lighter colour, using these and hanging them from floor to ceiling would be an incredible look. Keep the rest of the room simple again, however, and make sure any other patterns you combine with this have that same kind of dark romantic vibe. Who DOESN’T love an oversized floral pattern? Okay, I’m sure you’re out there but still. 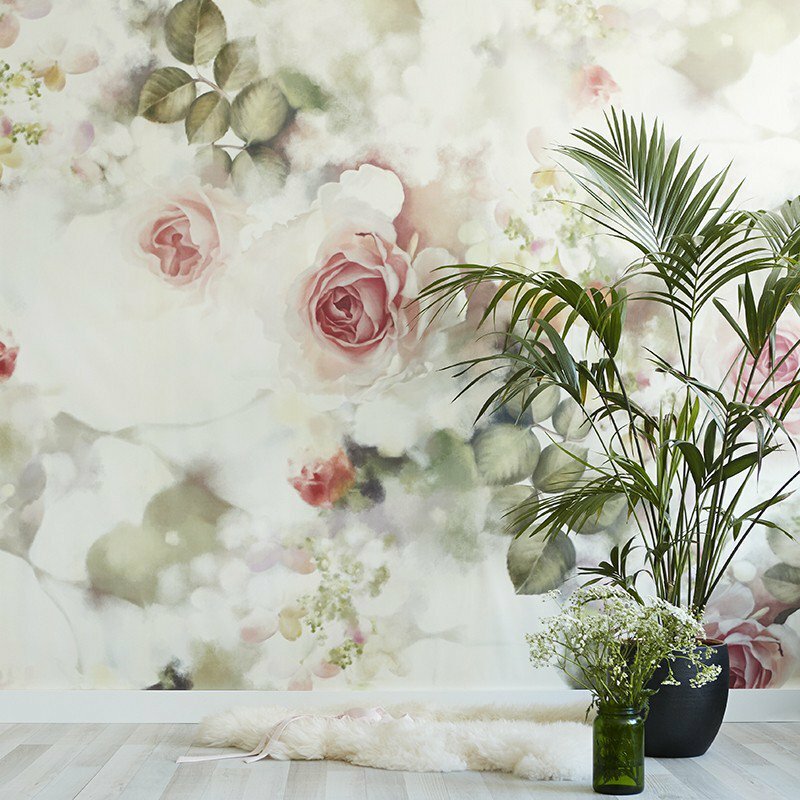 This look is stunning especially when splashed across your walls as a big huge in-your-face wall mural. 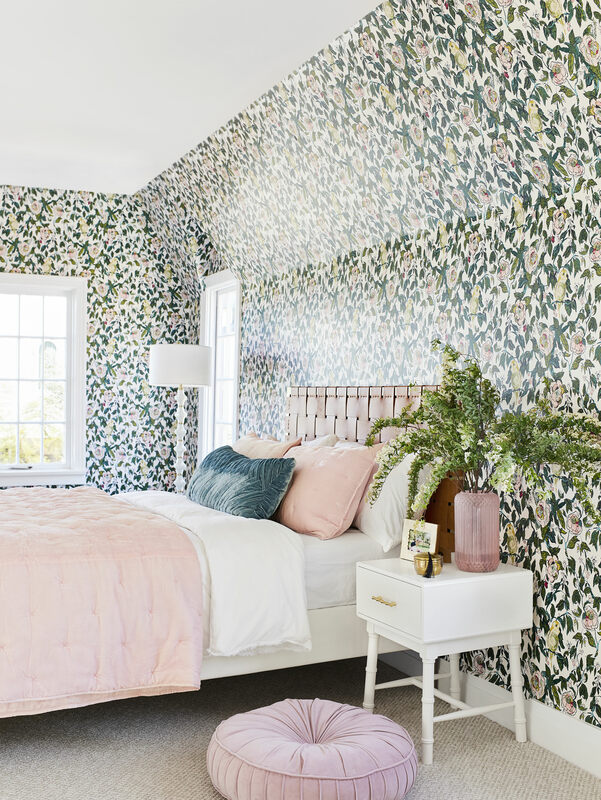 The designer Ellie Cashman is certainly the queen of this look with her wallpaper and fabric designs creating stunning hyper-realistic floral patterns that take your breath away. This one may be less well known than her darker floral patterns but I love how soft it is. I kind of just want to dive into that whole scene wearing a summer dress and no shoes and a daisy chain in my hair. And finally, tropical and jungle motifs have been popular for a couple of years now and they don’t seem to be going anywhere. I’ve loved the ones with the big palm fronds and greenery but the latest iteration is full of huge exotic blooms which will make you feel like it’s summer all year long. Even in England. When it’s raining. 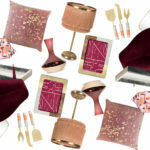 This bedding from H&M Home is bang on trend (love the pink/peach/berry combo of course) and they have quite a few different things in this pattern if you just want to dip your toe in the trend. So that’s my roundup of floral patterns I’m digging right now. Can you guess which one I want to use in my own home? 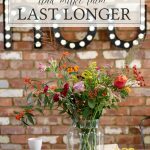 I’d love to know which is your favourite and if and how you’ve incorporated florals into your home? Go on, the comment box awaits. I’m sure what you’ll do with it in a room in your home will be amazing, but it’s not for me. Right now I love the Victorian and tropical florals. I once had Cath Kidston’s chintz floral on a wall of my laundry room (in my old house) and a wall in my office. It was quite cheerful and uplifting! I hope you have a fabulous bank holiday weekend! Love your curated florals Kimberly. The modern granny floral is my favourite look. So pretty, love the granny florals but in a houseful of men, think it would be a step too far. The H & M tropical is GORGEOUS ! I LOVE the Modern Granny Floral. Thinking that is the exact colors for my guest bath. I love that floral wallpaper has made such a big comeback. I love all of the trendy, modern twists that have come with it. I’m partial to the dark, oversized floral patterns. I find it to be so moody and unexpected. The tropical floral is my fave. Actually it seems as though you could’ve designed that look – that’s what I see you somehow incorporating into your new home. I love Rockett St George stuff so the dark floral curtains are my favourite. I thought it would be quite easy to guess which one you would go for but I actually have no clue. I can imagine them all in your house. I really like the Victorian floral actually. Which is odd as I’m not really a floral kind of person. Being an old goth, I love the black velvet curtains. Shame they’re out of stock. Love Ellie Cashman’s wallpaper. This one is different from what she usually does. Almost did my bedroom signature wall in one of them but then I went with texture instead. Wish I could show you a picture!